Space Shuttle Columbia Debris - Universe Galaxies And Stars Section. 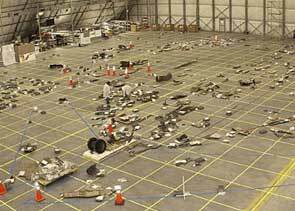 NASA Loans Out Space Shuttle Columbia Debris. Space Shuttle Columbia: Image credit: CAIB. NASA has released fragments from the Space Shuttle Columbia to a non-government group for the first time since the accident for study. The Aerospace Corporation, in El Segundo, California requested and will receive graphite/epoxy honeycomb skins from several sections of the destroyed spacecraft. The Aerospace Corporation will hold onto the debris for a year, and perform a series of tests to understand the maximum temperatures that it faced during re-entry. Several other "Request for Information" applications are still being considered by NASA. The first pieces of Space Shuttle Columbia debris, loaned to a non-governmental agency for testing and research, are on their way from NASA's Kennedy Space Center (KSC), Fla., to The Aerospace Corporation in El Segundo, Calif.
"The idea of studying pieces of Columbia came to me in the debris hangar soon after the accident," said Shuttle Launch Director Mike Leinbach. "It was clear to me we could learn a lot from it, and that we shouldn't bury the debris as we did with Challenger's."